His learned friends all this while were labouring to serve him. Grttviiis tried to get him a place at Duisbnrg, but could not succeed. The magistrates of Amsterdam soon after offered him a considerable sum to digest and revise Blondel’s “Remarks upon Baron ius’s Annals,” and gave him hopes of a professorship; but receiving a letter from Gronovius, which proposed to him a better offer, he declined the undertaking. 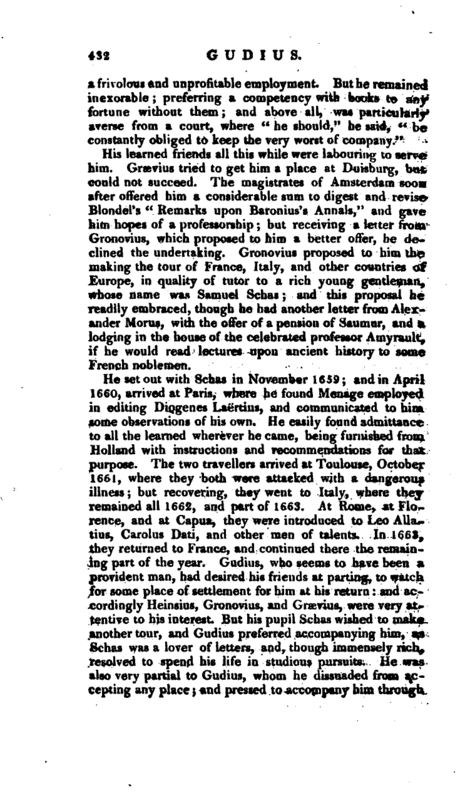 Gronovius proposed to him the making the tour of France, Italy, and other countries of Europe, in quality of tutor to a rich young gentleman, whose name was Samuel Schas; and this proposal he readily embraced, though he had another letter from Alexander Moms, with the offer of a pension of Saumur, and a lodging in the house of the celebrated professor Amyrault, if he would read lectures upon ancient history to some French noblemen. 1661, where they both were attacked with a dangerous illness; but recovering, they went to Italy, where they remained all 1662, and part of 1663. At Rome, at Florence, and at Capua, they were introduced to Leo Ailatius, Carolus Dati, and other men of talents. In 1663, they returned to France, and continued there the remaining part of the year. Gudius. who seems to have been a provident man, had desired his friends at parting, to watch for some place of settlement for him at his return: and accordingly Heinsius, Gronovius, and Graevius, were very attentive to his interest. But his pupil Schas wished to make another tour, and Gudius preferred accompanying him, as Schas was a lover of letters, and, though immensely rich, resolved to spend his life in studious pursuits. He was also very partial to Gudius, whom he dissuaded from accepting any place; and pressed to accompany him through | &e libraries of Germany, as he had already done through those of France and Italy. 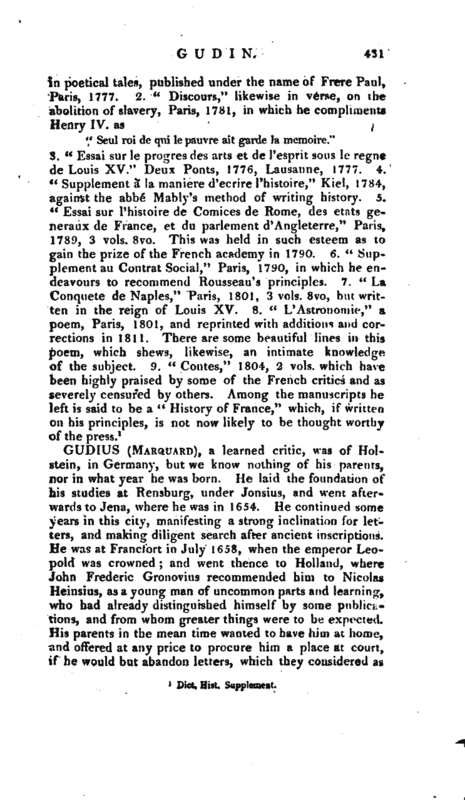 Before they set out for Germany, Isaac Vossius, jealous at seeing in the hands of Gudius so many valuable monuments of literature, whidrthey had collected in their first tour, is said to have acted a part, neither becoming a scholar nor an honest man. 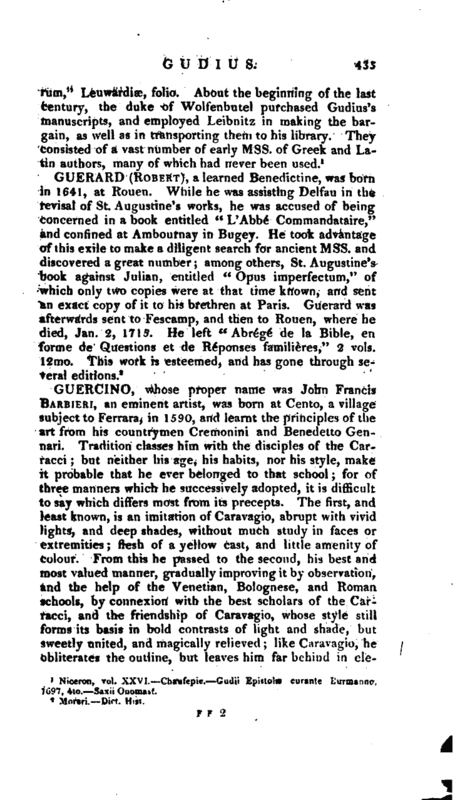 On the one hand, he affected to hold them light when he talked with Gudius; whom also he did not scruple to treat with an air of contempt, even in the presence of his friend Gronovius, saying, that Gudius had never collated any ms. but always used a copyist for that purpose, and that he did not know the value of them, but was ready to sell them for a trifle to the first purchaser. On the other hand, when he talked to Schas, he represented to him what an estimable treasure he was in possession of, exhorted him not to be the dupe of Gudius, but invited him to join his Mss. with his own; alleging, that they would enjoy them in common during their lives, and after their deaths bequeath them to the public; which unusual act of generosity would gain them great honour. But Vossius did not know that Schas loved books, and understood Mss. perhaps as well as Gudius: and Grsevius, in the preface to his edition of “Florus,” makes his acknowledgments to Schas, whom he calls rir exiniius, for having collated three Mss. of that author in the king of France’s library. 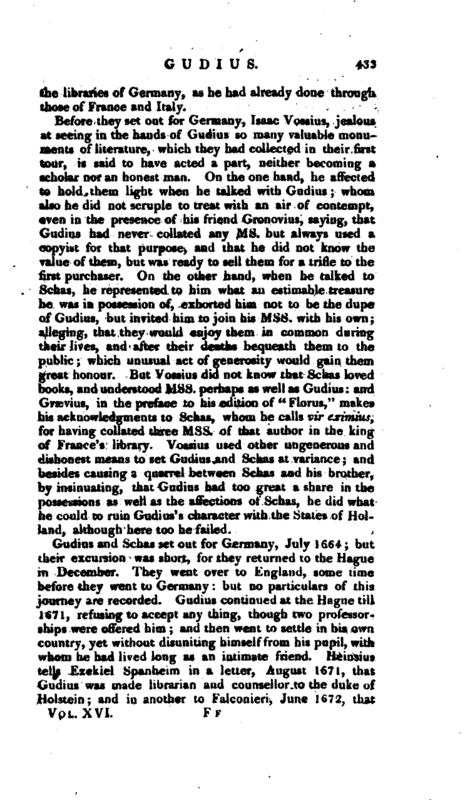 Vossius used other ungenerous and dishonest means to set Gudius and Schas at variance; and besides causing a quarrel between Schas and his brother, by insinuating, that Gudius had too great a share in the possessions as well as the affections of Schas, he did what he could to ruin Gudius’s character with the States of Holland, although here too he failed. Gudius and Schas set out for Germany, July 1664; but their excursion was short, for they returned to the Hague in December. They went over to England, some time before they went to Germany: but no particulars of this journey are recorded. Gudius continued at the Hague till 1671, refusing to accept any thing, though two professorships were offered him; and then went to settle in his own country, yet without disuniting himself from his pupil, with whom he had lived long as an intimite friend. Heinsius tells Ezekiei Spanheim in a letter, August 1671, that Gudius was made librarian and counsellor to the duke of Holstein; and in another to Fulconieri, June 1672, that | he was married. In 1674 he was sent by tbat prince to the court of Denmark and, December 1675, was informed at the Hague, that Schas was dead at Holstein, and had left his estate to Gudius, with legacies to Graevius, Gronovius, Heinsius, and other learned men: which legacies, however, were revoked in a codicil. The will was contested by the relations of Schas; but Gudius carried the estate, and, as Heinsius relates in a letter, 1676, from that time is said to have discontinued his correspondence with his learned friends in Holland, which we cannot be surprized at, if it be true, as suspected, that he had some hand in the will by which Schas left him his estate. 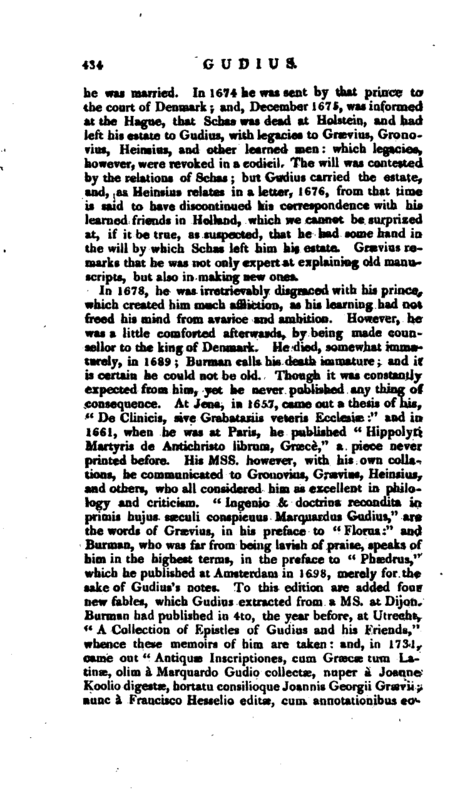 Graevius remarks that he was not only expert at explaining old manuscripts, but also in making new ones. Niceron, vol. XXVI.Chaufeple. Gudii Epistolae curante Burmanno. 1697, 4to. —Saxii Onomast.